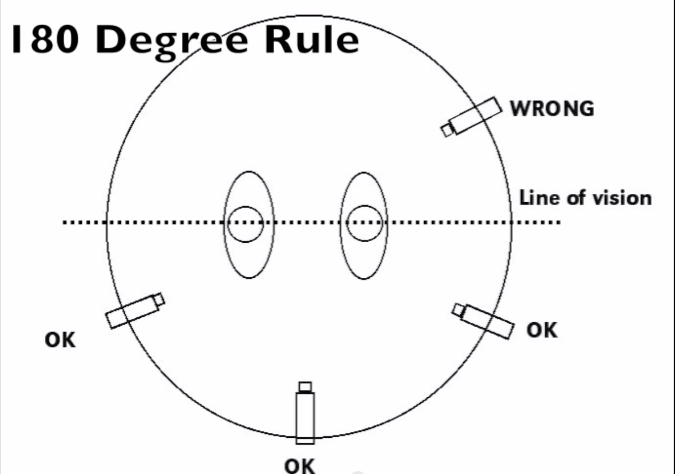 The 180-degree rule is a basic principle for establishing space between characters in a given scene. Basically, the camera must stay on one side of an imaginary line drawn between the characters, which keeps Character A in the left side of the shot and Character B in the right side of the shot. This helps orient the viewer. In the climactic scene of American Beauty (spoilers ahead, I guess), Lester and Angela have their romantic encounter. Lester is on the right side of the shot and Angela is on the left. They begin to kiss and the shot changes, but this established space stays the same. ...and Lester is on the right. Until she drops the bomb on Lester: this is her first time. Lester's disposition completely changes. ...and Angela on the right. This signals Lester's change to the audience: from sexual thrill-seeker (viewing Angela as a sexual object) to a concerned father-figure (viewing her as the kid that she is). The cinematography spatially signals this change in these characters' relationship to each other. 0 responses to "Breaking the 180-degree rule in American Beauty (10 Pics)"